I was contacted yesterday by Noelle Crombie from the Oregonian. She wanted OpenCarry.org to comment on the case of Warren Drouin and Steven Boyce who have undertaken a campaign of long-gun open carry in the Portland area. While pointing out that our mission at OpenCarry.org is to advance the right to openly carry properly holstered handguns, I went on to add that we would not condemn these men for exercising their rights. I was also pleasantly surprised to hear that the behavior of police when approaching the two activists has been largely professional. 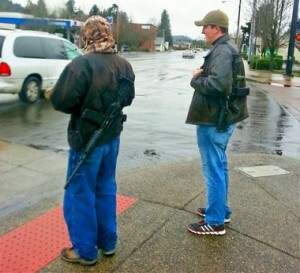 This entry was posted in Media Bias, Open Carry, Oregon. Bookmark the permalink.